The weather is completely miserable, so bad that the tribes are gifted fire making kits and temporary tarps to withstand the cyclone. When the weather does calm down a bit, the game is most definitely on. After a close-call with being the main target on the David tribe, Nick and Christian solidify a partnership as the "Mason Dixon" alliance. Davie finds the Hidden Immunity Idol after noticing a tree with a bright orange string. 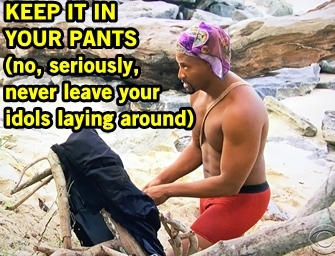 Carl throws out Lyrsa's name as weakest on the tribe to sacrifice if they lose, and she's pretty pissed. Over on Goliath beach, Dan's game is getting sloppy. Jeremy finds the idol in Dan's hanging laundry, and everyone is very aware he's smitten with Kara. Angelina, Kara, and Natalia make a girls alliance and plan to drag along three other guys to get the majority. But Natalie's target is only getting bigger with her strong personality and lack of self awareness that others aren't liking her vibe. The Goliath tribe completely dominates the Immunity Challenge that requires paddling a boat, then very delicately balancing and assembling a puzzle. While the Davids got to avoid voting their first time around, the game has officially gotten real. Jessica, Bi, and Carl intend to vote our Lyrsa for being weak, but Gabby is concerned is strength is a priority then she could also be a target. Elizabeth and Lyrsa flip all the plans around and choose to target Jessica, to knock out two different pairings with Bi and Carl. Gabby awkwardly asks Christian if he wants to play with her ("In the sand? "), but really she wants Christian to vote on her side. Mason Dixon are the deciding votes this week, and I guess naming your alliance after a line would lead to something like this at some point. Tribal Council Time! The tribe addresses the horrendous weather they'd endured in such a short span of time, while also developing bonds. Lyrsa vocalizes she knows she's been dubbed the weakest link and is on the chopping block. 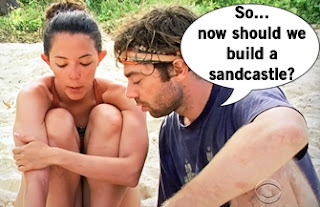 Jessica says if you want to play the game until Tribal Council, then that's too late. Gabby's polite about it but is basically like uhhh, we're all playing girl. Everyone agrees they have a play tonight which means someone, or some group, isn't fully in the know. Nerves are high, and it all comes to a head in a big ol' blindside when Jessica is voted out of the game.